Desert Foothills Air Conditioning & Heating Inc is proud to serve the Carefree community! About Carefree, AZ - Happy to be your hometown Heating & Air Conditioning Contractor! Carefree is located in Maricopa County, AZ, and as of 2007 the population was 3,875. Carefree is known for being an upscale residential area that features the Carefree sundial, which was erected in Sundial Circle Plaza in the late 1950s. 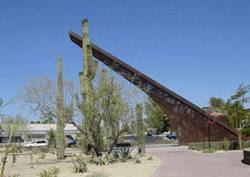 This sundial is the third largest in the entire Western Hemisphere. Carefree and the rest of Maricopa County are known for having a subtropical desert climate with warm winters and extremely hot summers. There are a variety of attractions to be found in Carefree. The Spa at Carefree Resort and Villas is a great option, as are golf outings at Desert Forest Golf Club and the Boulders Resort Golf Club. Other popular attractions include the Trail of Painted Ponies store, the Spirit in the Desert Retreat Center, and the Easy Street Gallery.